Canadian citizens and permanent residents can access Expedite Q Services to join the Canadian fast track program known as Goes NEXUS. Expedite Q Services are the only world specialists in global passport control fast track programs. We ensure that your application has every chance of success by ensuring it is complete, accurate and mistake-free. We also advise you of any additional steps you need to take and of any additional documentation you must provide. We advise you of any problems you may encounter from filing the application and we respond to most questions within 1 business day. Canada NEXUS is a Trusted Traveler program that allows expedited clearance for pre-approved, low-risk travelers upon arrival in Canada. Each membership card is valid for 5 years. Applicants must be in possession of either a machine-readable passport or permanent resident card.At airports, program participants proceed to NEXUS kiosks, present their machine-readable passport or permanent resident card, place their fingertips on the scanner for fingerprint verification, and make a customs declaration. The kiosk issues the traveler a transaction receipt and directs the traveler to baggage claim and the exit. Members may be selected for further examination when entering Canada or the United States. Any violation of the program's terms and conditions will result in appropriate enforcement action and revocation of the traveler's membership privileges. Expedite Q Services specializes in the checking and processing of NEXUS applications. We are a private company and are not related to any government agency. We cannot affect the outcome of your NEXUS membership. Step 1. Each applicant must pay the Expedite Q Services fee which is payabe after the appliction is submitted. Step 4. Once Conditionally Approved schedule and attend an interview at a US enrollment center of your choice. 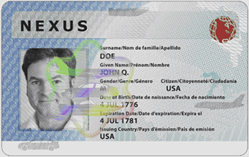 Your NEXUS membership is valid for five years from the date you receive your NEXUS membership card. Did you change your mind about using our service? The quickest way to get a refund is to email [email protected] We will process your refund within 24 business hours. There is no need to go via PayPal to get your refund - this will be a lot slower and can take up to several weeks if you make a chargeback. Please note we refund in full for applications not submitted or processed.